Aeolus in the 1930s on a run, wing 'n' wing. Note whisker pole behind genoa. 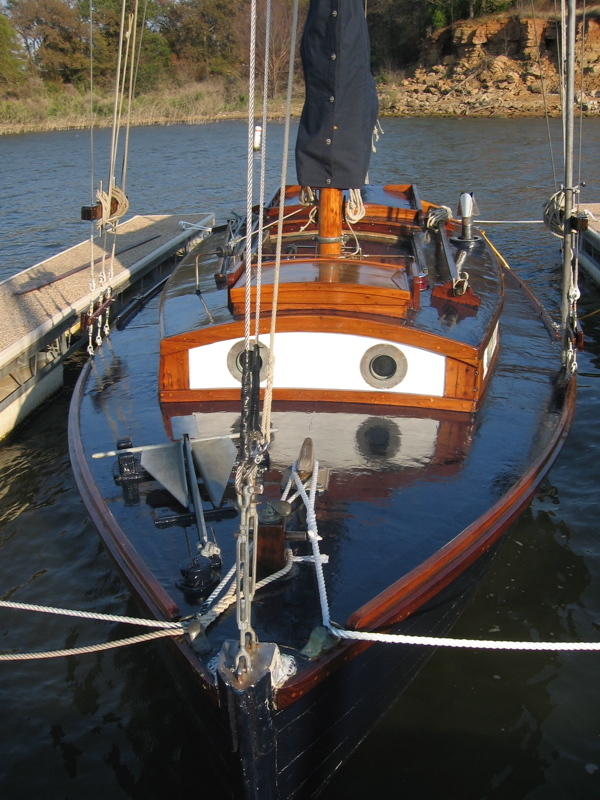 Walter "Cap" Elliott, who was Port Captain at the Portland Yacht Club from 1930-1946, ordered Aeolus, CROD hull number 3, from the Astoria Marine Construction Company in 1934. Cap's son Glenn, still a resident of Portland recalls, "I was just a boy of 10 or so when my dad bought Aeolus. We were living in the quarters above the yacht club. 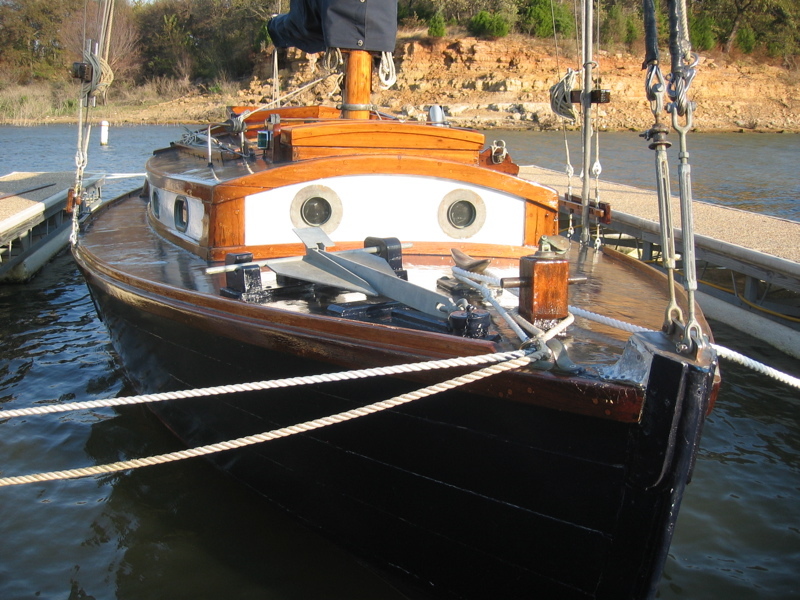 I believe we got the boat from AMCCO partially built and my dad finished the construction." "I remember one time in the mid-30's, my dad trucked Aeolus up to Olympia, WA for the PIYA Regatta. After the race, my mother and I joined him and we cruised for a while, then trucked Aeolus back to Portland." "Some time in the late 30's we sold Aeolus to Dirk Winters. As a young guy, I crewed for Winters during races, handling the foredeck. We didn't use a winch for the jib sheets in those days. There were two bullet blocks fixed to the clew of the jib. The sheets dead-ended aft in the cockpit." Glenn Elliott recently participated in the unveiling (see photo at left) of a print of Lisa Daniels' watercolor of Aeolus, donated to the Portland Yacht Club in memory of his father, Cap. Cap's youngest son, Jack, adds his recollections to the story, "I was probably 5 or 6 years old the first time I was on the Aeolus under sail. There was a fresh breeze putting our rail down as we approached the Interstate Bridge and I was scared. My dad told me to scoot down and sit on the cockpit floor and I would feel better. I probably stayed there for 10 minutes or so, until I realized I was missing out on all the fun by not being up where I could see and be a part of everything. That was the beginning of a long career of sailing and racing. I have many fond memories of sailing on Crods. Crods are surprisingly agile, for a boat designed in that era. They were solid, dependable and when the conditions got tough they were up to the task and very wet!" CROD enthusiasts participated CROD class races as well as informal explorations of the Columbia. On one occasion in 1936, Cap Elliott with Aeolus, Steve Wilcox with Susan (CROD #6), J. C. Ainsworth with Terry (CROD #4) and Dean Webster with Jean II (CROD #2) motored up the Columbia from the Portland Yacht Club to the site of the Bonneville Dam, then under construction. This delightful adventure was documented in an article for the October, 1936 issue of Pacific Motor Boat magazine by Gordon B. Leitch, friend of the CROD crowd and founding President of the Columbia River Yachting Association. This article and other documents and photos of the Columbia River One Design are in the archives of the Columbia River Maritime Museum. For additional information on the ownership history of all 12 CRODs, go to the History of CROD page. Aeolus' later owners included Don Jaxtheimer, Walter Johannsen, Dirk Winters, Mason Heidtke, Ron Moran, John Tucker, David Fastabend, and currently, David Kanally. Research is underway on the details of each owner's work and adventures aboard Aeolus, and as new information becomes available, it will be added to this page. The 1953 Portland Yacht Club Year Book lists Aeolus, Dirk Winters, owner. "I owned her from about 1973 until 1985 or 86. I sold her because I was building a 36' cold molded sailboat. 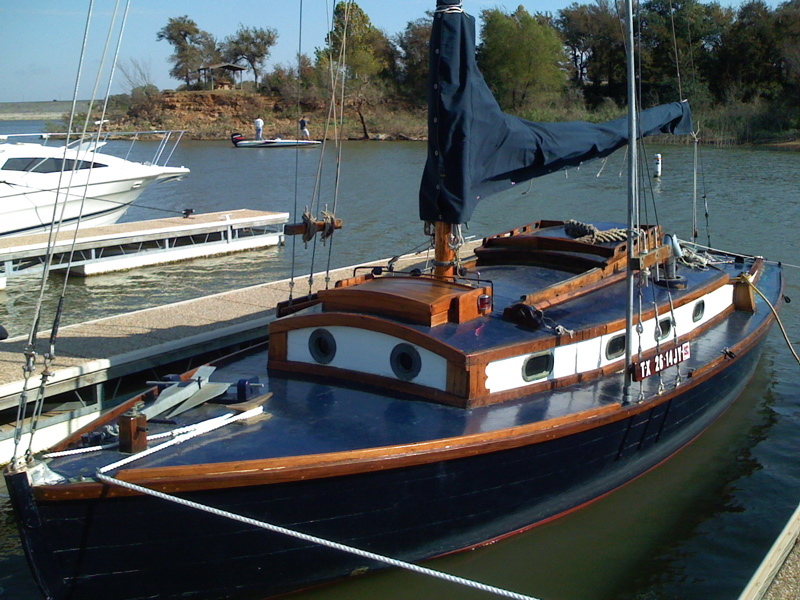 When I purchased her she had been setting unused for many years at Rose City Yacht Club, which my parents joined when I was 6 years old. The past owner had given up on her after "rebuilding" the motor and found that it overheated shortly after it was started. If I remember I paid around $1200 for her. The first order of business was to get the motor working. I found the problem to be a plugged water passage in the manifold. Found a new one and after putting it on the motor ran great. The next problem was the rudder post/tube. 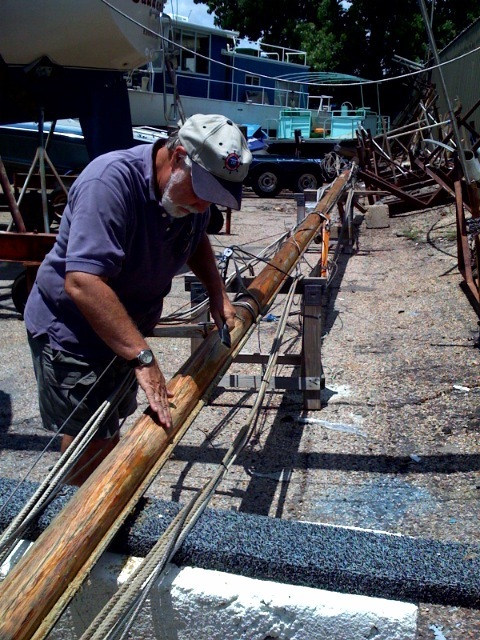 Being that the rudder shaft was steel as was the tube it had rusted so bad you could not turn the tiller. After putting a lot of Liquid Wrench down the tube I got it to move just enough to get the boat to a boat yard and have it pulled from the water. Once the boat was blocked up in the yard I managed to get the rudder and tube out. To do that I had to dig a hole under the rudder so it would drop down enough to clear the bottom of the boat. Then I cut off the rusted tube (very easy it had rusted so thin) and cleaned up the rudder shaft. I made a new tube and put it all back together. 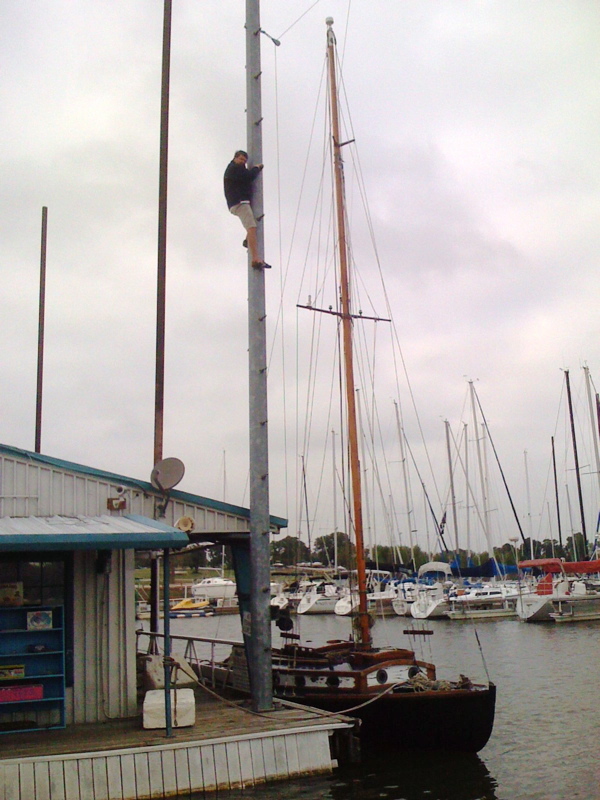 Over the years I did a lot of work on her and had a lot of fun sailing her." "My dad and I picked up Aeolus in Tigard, Oregon the summer of 1995. I got it from a guy by the name of John Turner, he got it, I believe, from Ron Moran. The boat had been out of the water for a number of years. It had been sitting in John's dad's driveway. We loaded the boat (mast, boom, sails, and the engines (they were sitting in the yard next to the boat) on a flatbed utility trailer behind my dad's pick-up and brought it to Astoria where we put it in the woodshop at AMCCO. The boat had a lot of tree leaves and debris on deck (it had been under a deciduous tree). Over the years, the debris rotted out the canvas on the deck and, in turn, parts of the deck and the sheer plank on the starboard side. 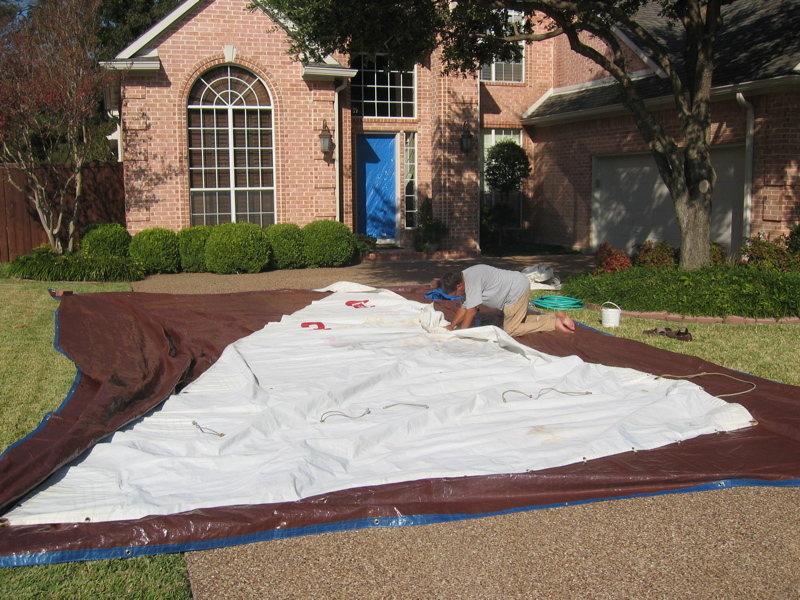 Between 1995 and 1999, in my spare time, I replaced a portion of the starboard deck, all four sides of the house, (the top of the house is original) recovered all the deck surfaces with Dynel cloth and Araball. 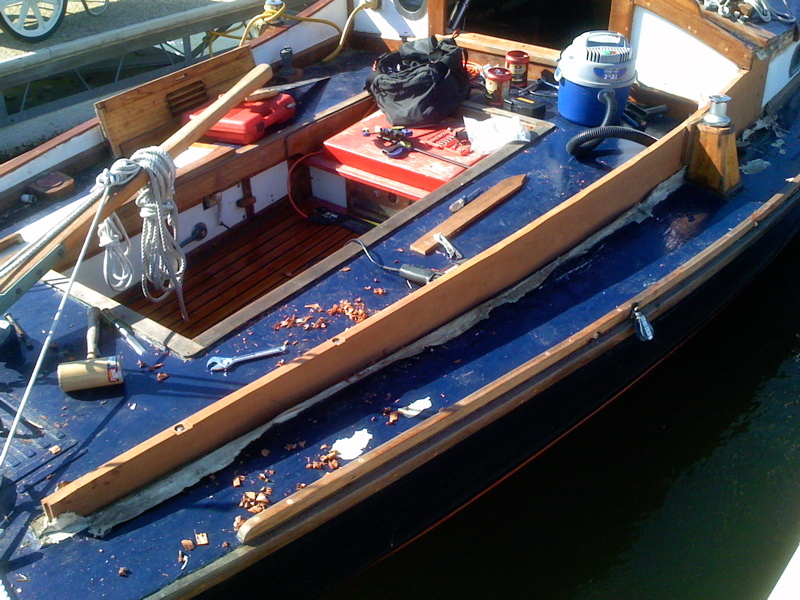 The transom, all of the guards, exterior trim, and forward hatch were also replaced at this time. The main hatch on the house is original, but rebuilt. 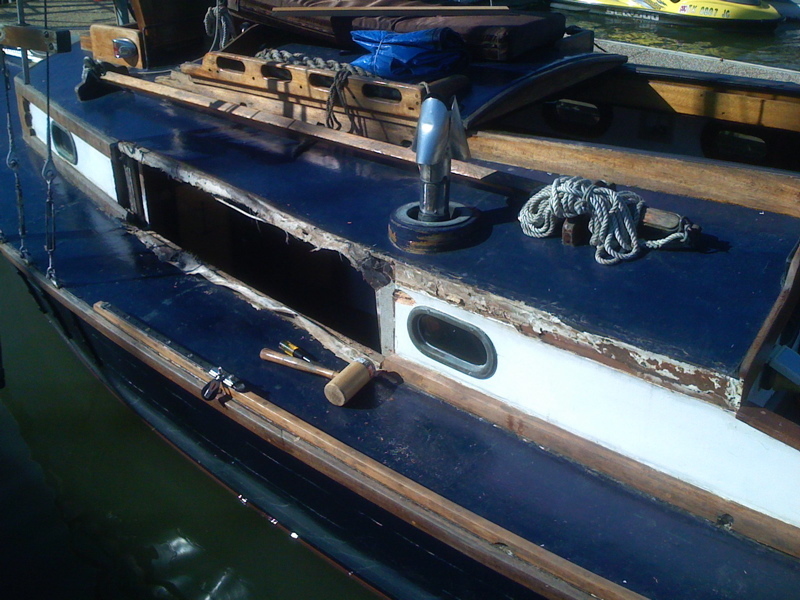 The interior was completely gutted when I got the boat. The interior took the most time to do. I went to the maritime museum here and looked at their CROD and got ideas for the interior. Once I had the interior done, I figured I was going to have to buy a new engine because they had been outside in the rain for God knows how long. My dad said "that engine was probably running when it was taken out, fix the distributor and give it a try." Well I did, and it did run so I put it back in the boat. 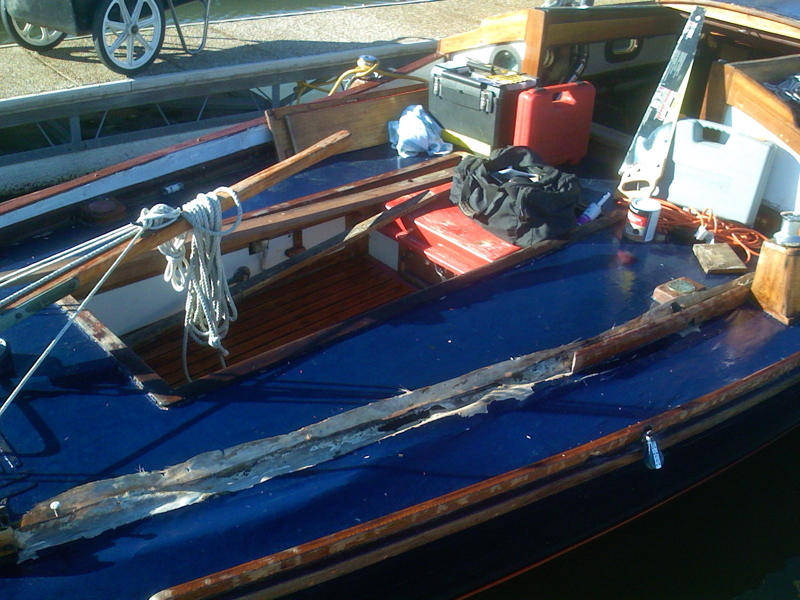 The boat was then rewired and re-plumbed, and refastened with stainless steel screws. She went in the water for the first time in many years for about two months during the summer of 1999. 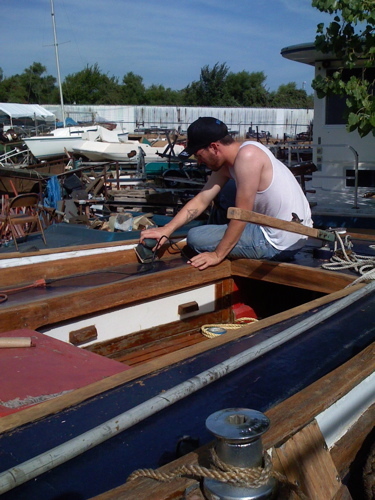 We just did regular maintenance to the boat for the next couple years. 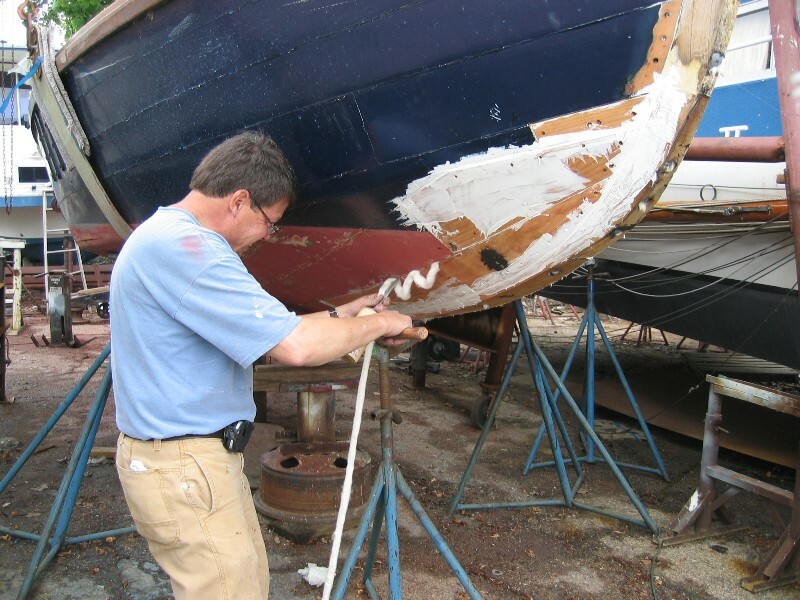 In the winter of 2003, I replaced the port chine, the keelson and keel bolts, sandblasted the swing keel, built a new swing keel trunk." 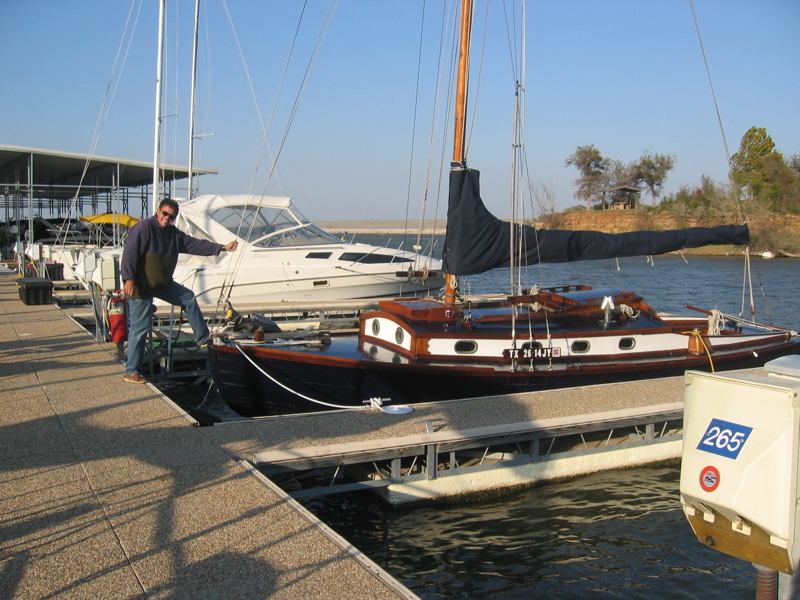 Like all true boat enthusiasts, David Fastabend came into the market for a bigger boat, and sold Aeolus to David Kanally of Coppell, Texas in July of 2003. The transaction took place over eBay, probably the only imaginable marketplace for an Oregon seller and a Texas buyer to find one another! David Kanally hired a marine transport company to bring Aeolus to Texas. A photo documentary of the offloading and mast-stepping can be found in Gallery 2. 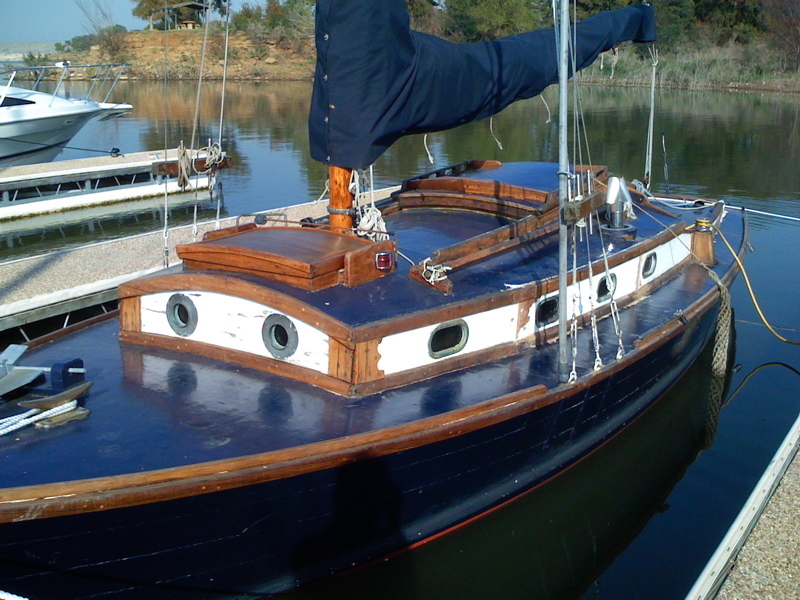 With the exception of the updating of the ceiling of the house and tufting of the berth cushions (see interior shots in Gallery 1), Kanally did only painting, varnishing and routine maintenance to do, thanks to the quality restoration done by Fastabend. 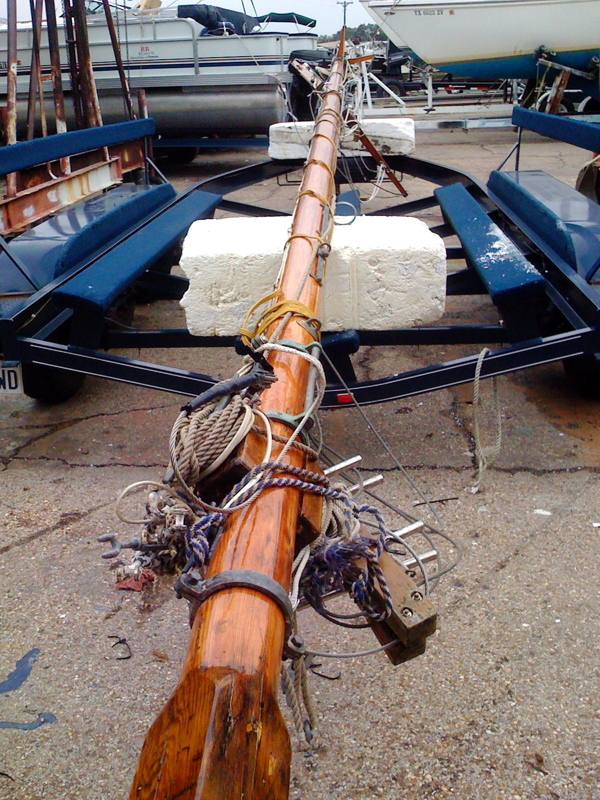 By the winter of 2006-2007, a soft spot had appeared in the joint between the planks and the stem on the port side. Aeolus was due for a bottom job anyway, and in the course of the inspection that followed the haul-out, it was discovered that a good portion of the gripe was rotted. With help from Bill Taylor and the other guys at Taylor Marine, the gripe was removed, (but partially in crumbles). Kanally referred to the construction drawings to come up with a pattern for a replacement gripe, to be made of laminated white oak. The boys at Harwood Lumber of Dallas came through with a perfect replacement blank, as well as a replacement for a section of the keel, to be scarfed in just aft of the gripe. Thanks to the expert hand of veteran shipwright Lewis White, the appropriate rabbets were chiseled the old fashioned way. As work continued, the stem knee was also determined to be beyond repair, and a replacement piece was made and fitted. Planking turned out to have its own challenges, requiring the building of a steam box to make the planks supple enough to survive the twists at the stem. The work in progress is chronicled in the thumbnails below. Click on each for a full-size view. By 2013, Aeolus would again find new waters and a new owner, as Brian Stock of Florida, acquired her and moved her to the St. Augustine area. Brian brings many years of sailing experience in the US and Europe to the party, and has already enjoyed a test sail aboard Aeolus! 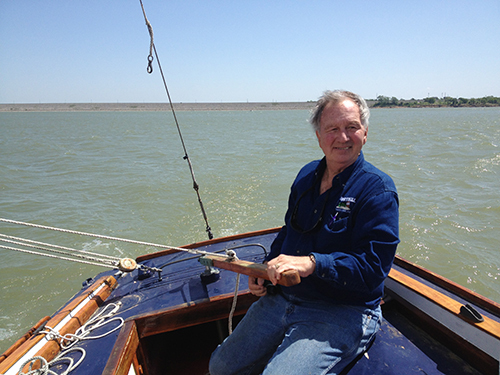 Brian Stock sailing Aeolus for the first time, 2013. 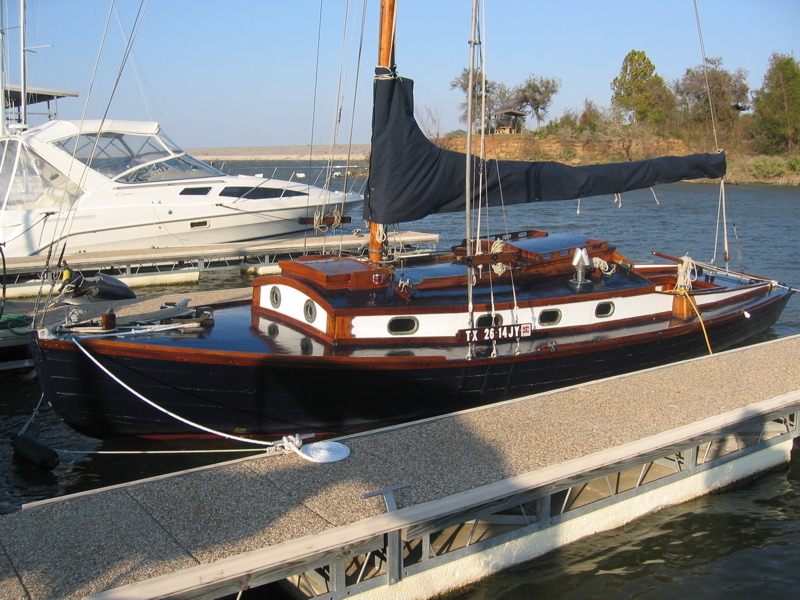 More recently, Aeolus was sold to new owners in the Atlanta area, and has since been retired. Aeolus had a long life, with generations of sailors enjoying countless hours aboard!